It is the second day of the new year, but you need to put aside any resolutions involving eating healthy and make a Butterfinger Cake. Believe me, you will be glad you tried this incredibly delicious and sweet dessert! 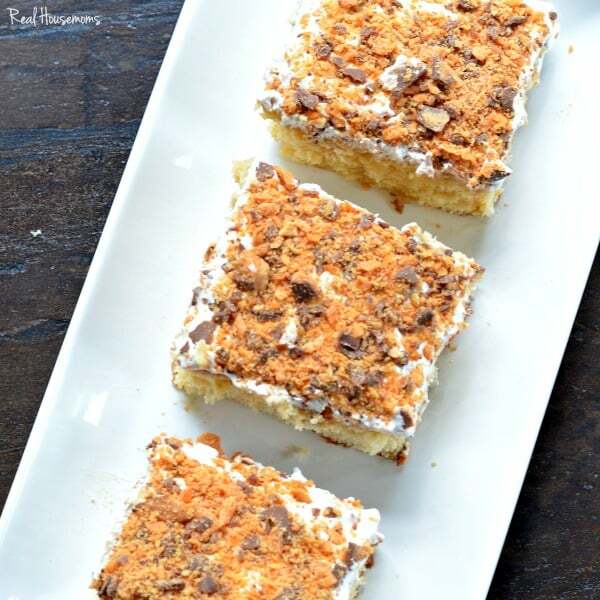 One of my dad’s favorite candy bars are Butterfingers and when I saw Couponing and Cooking post this recipe on one of our link parties, I knew I had to make it for my dad’s birthday! As I was making the cake, my husband could not believe the ingredients that were being used. He said it looked amazing, then just laughed and said, “Well, this is not diet friendly”. Nope, definitely not diet friendly, except the Cool Whip was “light”! We sang Happy Birthday to my dad, poured big glasses of cold milk, and dug in! Butterfinger Cake was a huge success and loved by everyone! My husband does not love Butterfingers, but thought that this was the best cake he has ever had. The rest of us do love Butterfingers and I would have to agree that it was amazing and is now my new favorite dessert! The next day, I texted my neighbor and asked if they liked Butterfingers because I had a treat for them to try. The cake was a big hit at their house too. They love when I make treats and bring some over for them to try. One of their favorites is the Apple Cider Cookies with Caramel Filling and I just made them a huge platter for the holidays! Butterfinger Cake is perfect for birthdays, parties, or a treat to enjoy any day! 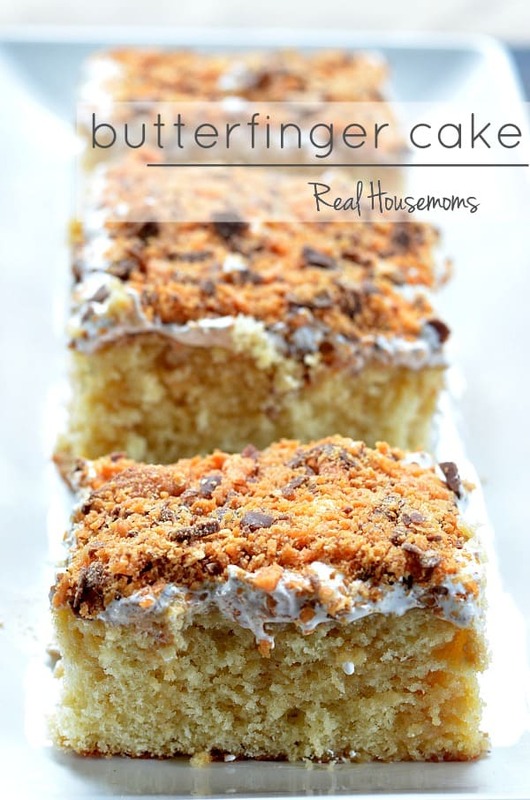 Invite some family or friends over and have some Butterfinger Cake! 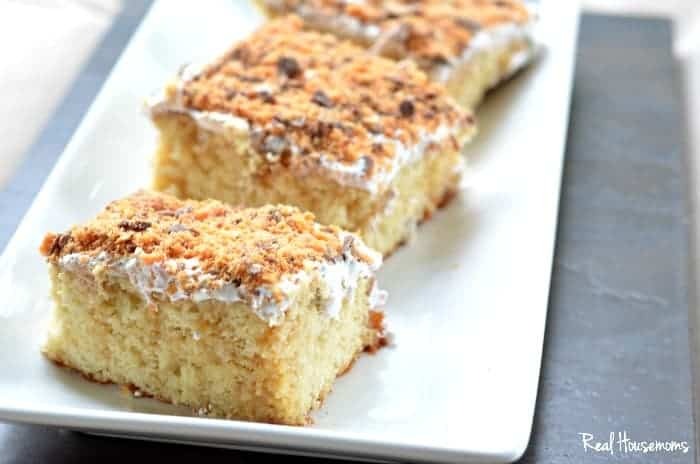 Butterfinger Cake is a delicious and sweet dessert, perfect for birthdays or any occasion, and is a big crowd pleaser! This looks so good! Butterfingers are my wife’s favorite! Already printed this out and will be making it soon! Yum! I just made this and is now one of my husbands favorites! It was very easy and something different! Love trying new recipes keep them coming! Thanks for the shout out! So glad you liked it! Kaylee, Thank YOU! We loved the cake and it was a huge hit! I make this but skip the condensed milk. I also mix 1/3 of the crushed Butterfingers in with the Cool Whip and then sprinkle the remaining crushed candy on top. I also use butterscotch topping instead of caramel. I have made this cake for 15 years or more…never used any cake mix but milk chocolate. Not just regular chocolate but MILK chocolate. That’s the way my grandmother always made it! I made this today for Thanksgiving… Great recipe I just put too much caramel mix on the cake… But it still taste GOOD!! Plan on making this cake. Looks yummy. Totally turned off by the chatter about hair, dressing us as a family. Etc. Let’s have more talk about the recipe. You will love it! Thank you.